What's key is that you are helping students participate appropriately. There are 7 expectations that students should be aware of and meet. Students should come prepared with questions. If you are using KnowAtom or you're starting with an anchor phenomenon, they should be developing questions as students encounter that phenomenon. If they have a question, they should write it down somewhere and then bring it to the Socratic dialogue. All ideas are welcome. There are no good or bad ideas. Some ideas are inaccurate. That's true for anyone, young and old. Everybody has inaccuracies in their understanding. The goal of the Socratic dialogue is to work with the ideas and refine them as the dialogue progresses. Students should use accountable talk techniques and Socratic questioning techniques. For example, students could say to a peer, "What is it about what I said that you don't understand? Or what is it that I said that is unclear to you?" Those are Socratic questioning techniques. Agreeing or disagreeing with somebody's idea or evidence is okay. Judging the person is not. Your ideas are not who you are. Your ideas can change, they can morph, and so on. If I don't like your idea or if I disagree with it, it doesn't mean I don't like you. It's not personal. This can be very hard for students, especially as they get into middle school. However, they are important life skills that apply far beyond the science classroom. Share the floor. Encourage those who haven’t shared to share. Respectfully call out peers who violate the rules. As you’re setting these expectations, it is important to model the same kinds of behaviors that you want your students to develop, and to treat students’ ideas the way you would want your ideas treated. This includes really listening to what students are saying and not pre-judging what you think they think. Your follow-up questions should be based on what you actually hear. Also remember that students will look to you for validation, through words such as perfect, good, close, etc. Don’t give it to them. Put it back on the group to come to some conclusions. In a similar vein, use professional judgment when it comes to intervening in misconceptions, but allow students to leave with questions because not every question will be answered. Finally, dig for the root of students’ reasoning. In general, there is a context in which a student’s idea makes sense. Ask questions to help the student articulate the context so you can contrast that context with the more typical context. Let’s take an example related to states of matter. When enough thermal energy is added to a substance, it will change phase, moving from solid to liquid or from liquid to gas. As you go from a solid to a liquid to a gas, matter becomes less dense. A common idea is that a substance that's less dense, like a balloon filled with air, will float on a denser substance, like water. In a discussion, a student might say something like, "Well, that must mean that ice is warmer than liquid water because ice is solid." It’s important to dig to the root of the student’s thinking around this big idea, around what their contribution is because what some people might say is that, "No, actually ice is not warmer than liquid water." That's the validation. That's the traditional model of instruction. However, in a next generation Socratic dialogue, the teacher could ask, "Why would you say that ice is warmer than liquid water?" The student may say, "Well, ice floats on water and they're both the same substance." If the class has been learning that solids are denser than liquids, it’s a logical, although inaccurate, idea to say that since ice floats on water, it is warmer than water if warmth is the only thing that affects density. In fact, what that student is come upon is the fact that water is an exception to the rule. When water freezes solid, it actually becomes less dense. That's an opportunity to dispel the myth. As this shows, having an effective Socratic dialogue is not about validating “right” or “wrong” answers. Instead, its goal is to get to the root of the students’ thinking and then building on that as students work with and refine their ideas and the ideas of others. 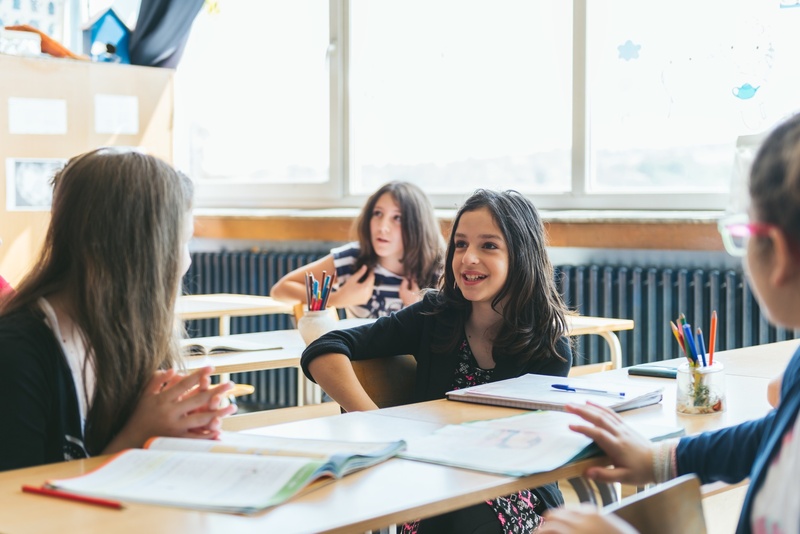 In order to get students to make deep connections and actually participate in the Socratic dialogue means that you have to take students' ideas seriously. If you don't take that idea seriously, there's no way that anyone will work with it because everybody is just going to push it off.